No. 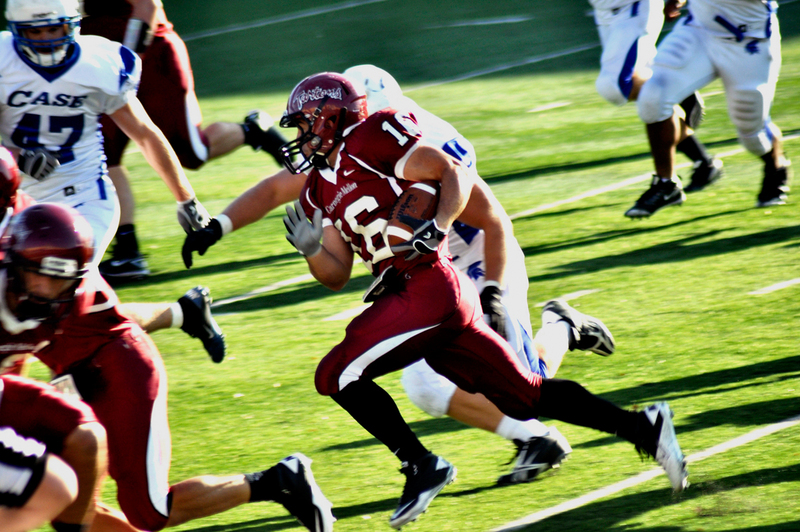 16 Jake Nardone runs the ball toward the end zone in the final game of the 2011 season against Case Western. The Tartans lost the game 38–24. The Carnegie Mellon Tartans defeated the Allegheny College Gators 37-7 last Saturday. With the win, the Tartans start the season 2-0. Carnegie Mellon quickly took the lead after a 55-yard, eight-play drive that ended with a 27-yard field goal from first-year kicker Connor Young. After being down 3-0, the Gators responded with a 77-yard drive that ended with a one-yard touchdown run. After that score, Carnegie Mellon took control of the ball game and reeled off 34 unanswered points. The scoring frenzy began with a 9-yard sprint into the end zone by senior running back Patrick Blanks with 12:18 remaining in the second quarter. Junior wide receiver Tim Kikta followed him into the end zone with a 39-yard touchdown catch from junior quarterback Rob Kalkstein to make it 17-7 going into half time. Kikta and Kalkstein did not waste anytime increasing the lead on the first play of the Tartan’s second possession of the second half with an 82-yard touchdown. The score was 23-7 after Young missed the point after attempt wide right. Blanks followed suite with his second and third trips to the end zone to put the game out of reach at 37-7. He ended the game with 52 yards on 14 carries and three touchdowns. Overall the Tartans had 461 yards of total offense with 261 coming on the ground. Kalkstein ended the game with two touchdowns and a career-high 200 passing yards. Defensively, Carnegie Mellon excelled, holding the Gators to only 207 yard of total offense on the day. Junior safety Jack Butler and junior linebacker AK Brefo led the way, each with eight tackles. "We lost to that team 3 years in a row. The win yesterday really shows the character of this team. It's great to see the team progressing week to week. Hopefully we carry this momentum into our next game...." Blanks said. Carnegie Mellon plays next Friday at Gesling Stadium hosting Catholic University. Kickoff is set for 7:00 pm.